The new year is almost here and the temptation to go out with a bang and attend a lavish celebration always seems present. From the expensive parties to the food and hotel stay, ringing in the new year can rack up quite the bill. While your wallet may be advising you to spend the night in bed watching T.V. and listening to fireworks go off, you can still do something fun and exciting to ring in the new year without spending your last dime. If you made it to the end of this year in one piece, you should have quite a bit to be grateful for, so there’s nothing wrong with wanting to celebrate with your loved ones. 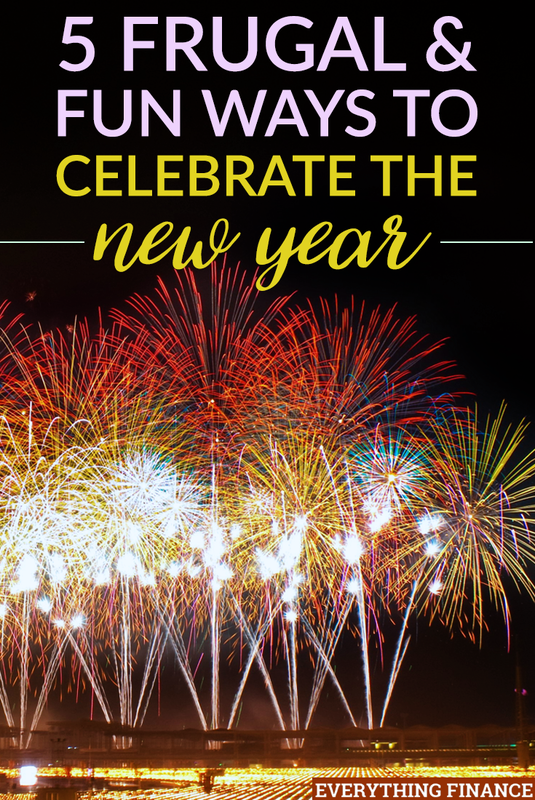 Here are 5 frugal and exciting ways to ring in the new year. One of the simplest ways to celebrate the New Year without sacrificing any fun is to invite people over to ring in the New Year together. You can host a potluck dinner and make your own drinks, play games, watch movies, etc. You can eliminate transportation and hotel costs completely and pick up a few decorations from the dollar store to keep costs low. When you’re surrounded by close friends and family, it’s easy to stay entertained and have a good time. I recently went to my sister’s home for Thanksgiving and had a blast just playing games and talking with everyone. We played this one really fun game that stood out where we split up into teams and had to listen to a theme song from a popular television show. Whoever revealed the correct name of the television show first won a point for their team. I found it interesting that this super fun game can be found on YouTube for free. There are also different genres for trivia like ‘popular 90s television show theme songs’ and ‘songs from popular video games’. That just goes to show you that entertaining a group of people is easy and cheap. Some of my other favorite games include Taboo and Cards Against Humanity, and Apples to Apples is a fun one to play with kids. If you don’t feel like going through the hassle of decorating, cleaning up and hosting everyone, consider going to someone else’s New Year’s Eve party at their home and let them do all the organizing. If you’ve been invited somewhere, be sure to ask the host if you can bring anything or do anything to help. On your end, you might just have to contribute a food item and/or something to drink. Instead of buying a prepared snack tray at the grocery store, try to create your own and include seasonal fruits and veggies, dip, cheese, crackers, etc. Some veggie trays for larger groups cost around $20+ and you can get more bang for your buck (and more food) by preparing your own or making a special dip to go with chips. Most cities have free New Year’s Eve celebrations with live music and other entertainment to enjoy for a fraction of the cost of attending a formal event. Before you write off the idea, check with your local library, park district, churches in the area, or an online event listing site for your local area to see which events are coming up. To minimize costs, you can eat before you go to the event and minimize transportation costs by sharing an Uber or Lyft with friends. If you try to stay somewhat close to the area you live in, you won’t have to worry about paying for a hotel, either. If all else fails, visiting a local bar is always an option and it’s much cheaper than going to a nightclub. My husband and I spent New Year’s Eve at a local bar with friends back when we were in college and we had a blast. There was a DJ, discounts on food and drinks, a free glass of champagne for the midnight toast, and while there usually isn’t a cover, I think we paid about $5 to get in that night. I know spending the evening at a casino doesn’t sound very frugal, but it can be as long as you’re 21 and won’t go overboard with gambling. If there are any casinos in your area or if you’re interested in traveling to one, they are bound to have a New Year’s Eve celebration for guests. Casinos are usually free to enter and provide free non-alcoholic drinks. I’ve heard that some casinos even provide free alcoholic drinks, but the one in my town doesn’t. These freebies are offered with the hopes that you’ll spend more money gambling, but you don’t have to. Order drink specials, grab food at the buffet and enjoy any special performances that might be scheduled for New Year’s Eve. Believe it or not, the casino is one of the best places where you can check out a live band or performance for free. If you think a theme party might be interesting, vision board parties are very popular. In January, most people are thinking about what their new goals and resolutions will be as it’s a great time to reflect. Why not jump the gun and help your friends create their own vision board on New Year’s Eve to manifest all their goals? I created a vision board about 1.5 years ago and it helped me stay motivated because I was able to visualize what I wanted my life to look like. You can ask all your friends to pitch in by bringing an appetizer or snack along with their ideas for their best life. Grab some poster boards at the dollar store along with a few art materials. You can collect old magazines from everyone so you can all flip through them in search of images that align with your resolutions. Creating a vision board was groundbreaking for me and looking back, I wish I would have had the idea to make an event out of it and create my board with friends while sipping champagne. These are just 5 frugal ways you can ring in the new year with your favorite people. I’m sure when you think about it, you’ll find many other options whether you prefer to stay home or go out. Remember to get creative and have a good idea of what you can afford to spend beforehand. Do you have any plans for New Year’s Eve yet or have you set a budget?